We are calling it. Greenfield development is officially dead in Brisbane and this article will explain why. Just one glance of Brisbane’s crane filled skyline and it is easy to see why people say and believe there is an oversupply looming. However by analysing a few obvious trends, there is a lot more than meets the eye, and statistics show a very exciting future ahead for Brisbane. Why are we seeing so many cranes and so many new residential apartment developments in the last 5 years? For most of Brisbane’s 200 year history, detached housing construction has been not just a logical choice in terms of affordability but also the only growth method the city had. This was until the 1990’s, when a tri-government partnership was established called the Urban Renewal Taskforce and was responsible for revitalising derelict industrial suburbs in Brisbane with the objective to create sustainable live-work communities in the inner city, revive local economies, deliver affordable housing and reverse the exodus of local residents and businesses. This taskforce, along with a huge national and international inner city urban renewal trend set Brisbane on a completely different tangent. Relic’s from Brisbane’s past. Source: Queensland State Library. The shift back to Brisbane’s inner city is now not only lead by younger generations but by Baby Boomers who want to live closer to services, entertainment, dining and things to do. Wherever you look, dwelling approvals of apartments now far exceed approvals of houses in Brisbane. This is no temporary fad, there is a clear reason why this is happening. To explain this concept further, the growth that we are seeing in the inner city today through apartment construction is a result of continued growth that use to happen on Brisbane’s outskirts which, at the time was out of sight and out of mind, but now no longer can or does occur to the extent it did in the 20th century. Brisbane has upheld a sustained increase of dwelling construction in line with demand and population growth however the dwelling type has now flipped to apartments. The establishment of the SEQ Urban Footprint, which is still in-tact today, protects 85% of South East Queensland’s open space by placing an absolute prohibition on subdivision of land located outside the Urban Footprint. Unlike other Urban Footprint regulations in Australia, some of which have been watered down or altered, the SEQ Urban Footprint is one of the most successful in Australia and this has lead to the conservation of green zones throughout the region and between our urban centres. This is a very good thing. A city cannot continue to expand outwards and effectively deliver the same infrastructure and services enjoyed by people within the existing urban boundary at a sustainable cost to government and therefore taxpayers. To put it simply, it is much more expensive to suburbanise and spread sparse populations over a large quantity of land compared to densification and upgrades of existing services within the current city boundary. How much more you ask? According to report by Infraplan, a leading Australian urban planning policy consultancy, greenfield development costs approximately 110% more than infill development. If you’re a numbers person, the below table illustrates the costs of Inner (densification) vs Outer (greenfield development). Not only are the up-front infrastructure costs substantially higher, but also re-occurring operating costs over 50 years is a lot higher as well. When controversy marred one of the last remaining developable greenfield sites in Brisbane known as Cedar Woods, located between Upper Kedron and The Gap, this just about signified the end of an era in Brisbane. No longer can large detached housing estate developments proceed unhindered without community backlash due to the removal of green open space. Originally touted as a ‘$900 million mega suburb‘ with 1,350 homes, the Cedar Woods development has now subsequently been watered down to just 480 lots in total. To put this into perspective, this ‘mega suburb’ now only makes up just 40% of the dwellings that will exist in Brisbane Skytower, a single 90 storey apartment tower in Brisbane’s CBD. Now enter Springfield – Australia’s largest ‘private city’ built on the fringe of Brisbane and home to 32,000 people. Springfield is expected to grow to 86,000 by 2030, which is a small fraction of the expected 1 million people expected to move to Greater Brisbane in the next 15 years. That aside, Springfield is actually now shifting it’s focus and has vowed to facilitate the construction of over 10,000 apartments as part of a new CBD area which can be seen below. In the short term some pockets of Brisbane may experience a temporary high level of apartments which may result in a marginal decrease of rents in areas of average desirability, however as property prices in Brisbane are between 30-40% cheaper than in Sydney, prices of apartments are unlikely to see large reductions. 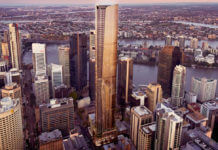 Brisbane is already Australia’s affordability and lifestyle capital, however as this trend continues, the city will also become one of the most urbanised and compact cities. As we are well aware, peak hour public transport in Brisbane is fast nearing capacity, so more needs to be done to invest in inner-city urban rail in order to cater for a million more people moving around Brisbane’s existing boundary. The Brisbane City Council needs to introduce planning provisions which promote affordable three bedroom plus housing modes for families within the inner city. While there is a vast array of choices around Brisbane’s inner city for new one and two bedroom apartment stock, there is very little three bedroom stock within a 10km ring that is deemed as ‘affordable’ for families. If we want to make Brisbane truly livable, we need to bring families back in from the outskirts of the city. By heavily incentivising three bedroom plus stock across the city, this could bring down the price of particular types of three bedroom stock as supply would increase. To complement this, more urban squares, parks, activity zones are needed directly near high density locations in order to enhance liveability and ensure future residences of these areas retain a connection with nature. Great article, have to laugh at the Bulimba Bridge Estate. I disagree that there is no more land – there is plenty of land, it is just too far to travel to. Generally people have a set time budget for commuting, beyond that they are not interested. Statements like ‘No land in Brisbane’ is meaningless because the definition of what ‘Brisbane’ is, is subjective. In addition to this, most green spaces (with the exception of national parks) are within urban areas and not on city fringes. Those rural areas are most often cleared, and have been so since European settlement in the 1800s. I also disagree about the rail. Sure, we need rail, but reform of the Brisbane Bus Network is well overdue. Auckland and Hobart have done it, and many places overseas have done it also, with very good results (e.g. Houston). The Brisbane Development blog seems to have something against improved bus services, even though such improvements are independent of rail and can be taken with or without rail expenditure. Bus Reform would solve many transport problems in places like Yeronga and the Centenary suburbs, for example. Rail is expensive. That means it will be limited to a small section within the inner city. Buses are cheap, they can be used to extend far from the city and fix the transport deficit we have now. As a writer for this blog, I have to disagree with the thought that the blog has something against buses. On the contrary, I feel that bus reform is needed, however, a growing city like Brisbane does need to future prof for its population. It can do this by improving bus services, and adding light rail/mass transit to the transport mix. There are many European cities that are much smaller in population to Brisbane and have both bus and light rail. Nice (340,000 people in 2010), Barcelona (1.6M people in 2014) and Berlin (3.5M people in 2012) are just a few cities which have both Buses and Light Rail or Mass Transit. Great article! Completely agree with everything said, exciting times ahead for Brisbane and SEQ. I enjoyed the article and also the land sale posters. I do have to say however that the % and number of apartments being built is staggering and there will need to be a slight correction. Like you said, there is limited 3 bed stock as everyone is cutting corners by building be student accommodation buildings. When you look at apartment growth in NSW and VIC, compared to QLD, it does appear concerning as we are building at a significant higher rate which will mean a correction.